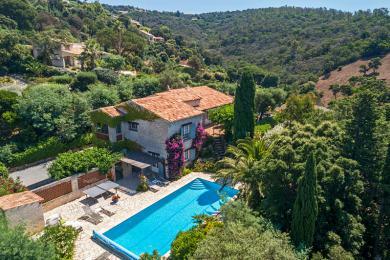 Spacious family villa in Les Issambres, Côte d'Azur. The swimming pool is large and acces to it can be closed which makes this villa very attractive to young families. Sleeps up to 8 guests + 2 children. Villa Molti's swimming pool can be sealed by a gate from the terrace; nice with young children. The good pool heating is great in the pre-season and off season. Attractive and comfortable interior; the house has been largely re-designed by the Dutch owners. Through a hall you get into the spacious living room. The heart of this area is formed by a fireplace surrounded by a U-shaped sofa with 3 comfortable sofas. There is also a new dining table with four chairs and sofa for children. Two pairs of double doors at the front ensure a good light and give access to the terrace. From the living room you enter the Provençal cuisine. It is well furnished and fully equipped, including a dishwasher, refrigerator, microwave, microwave oven, etc. In the utility room you'll find a washing machine. There are 4 bedrooms on same level as the living room. The master bedroom is lockable, has a double bed, ensuite bathroom and doors to the terrace. The second bedroom also has patio doors to the terrace and the third bedroom has a private balcony at the side of the house. These bedrooms each have a private bathroom and two single beds, which can be placed side by side or seperately (twin beds). These three bedrooms have fitted wardrobes, ceiling fan and air conditioning. Near the front door is another bedroom for children with (safe) bunk beds and a small bathroom, this bedroom is not provided with airconditioning. At pool level there is a fifth bedroom with terrace, private bathroom and two single beds, which can be placed side by side or seperately (twin beds). This bedroom can (on request) be reserved at an additional cost. The flowery, well kept garden with palm and plane trees is well laid out at different levels on a mountainside. Through double doors from the living room, two bedrooms and kitchen have access to the spacious terrace. Because the method of construction around the house, you can enjoy the sunny terrace, but also shady places, like the lovely old olive tree. The terrace has a new lounge set, a garden in front of the living room and a garden at the side of the house near the kitchen. Here you can enjoy eating outside in good weather. BBQ also available. at a level below the terrace, there is a professional pool (12.5 x5m) with electric unwinding deck. Also, the pool is locked by a fence from the terrace. Ideal for families with children. The pool can be heated against additional cost at your request. The pool terrace has plenty of sun loungers, a small outdoor kitchen with refrigerator and a gazebo with attributes to play in the pool. Down in the garden there is a jeu-de-boules alley. Table tennis table available. Villa Molti was recently purchased by new owners before the summer holidays, and refurbished with new outdoor furniture. Remember to bring ground espresso coffee from home, so that you have a delicious cup of espresso or cappuccino during your holiday to enjoy! Villa Molti is situated on a hill in Les Issambres. Through an inside path through the villa next to you , you are within a fifteen minutes walk to the beach. When you drive the car down it is only 5 minutes to the beach. (Saint Tropez in summer directly accessible by boat from the port of Les Issambres). For a game of tennis with sea views, visit the tennis court of Les Issambres. To enjoy eating out you will not have to drive far. In San Peire There are several good restaurants. Favourite "Le Provencal / Les Muriers' with its beautiful terrace under the plane trees. Or dine at the brasserie! Cap mail gives you a beautiful sea view while eating fresh seafood. Otherwise, you are just 15 minutes from Ste Maxime, with many more restaurants. When would you like to arrive at your villa? The (available) changeover day is indicated in green. * Prices include VAT and tourist tax. These two beautiful coastal towns, surrounded by the larger Sainte-Maxime and Frejus Saint-Raphael, are an ideal destination for a family holiday in southern France. In particular because of the beautiful long sandy beaches, relaxed atmosphere and convenient location. Our VillaSud Team has spend many years in the South of France, and the charming coastal town Les Issambres is one of our favorites. Also worthwhile is Saint-Aygulf with its beautiful shaped bays, beaches and nature. Don't forget to visit the medieval town of Roquebrune-sur-Argens as well! 4 camping beds (also to be used as a box) and 2 highchairs are available. Sheets for the camping beds are available free of charge on request. There is a welcome hamper and the beds will be made up ready for your arrival. Smart Start: There is a welcome hamper and the beds will be made up ready for your arrival. Pool: Private Pool size: 12.5 x 5 m.